We can definitely say that today was a full day. 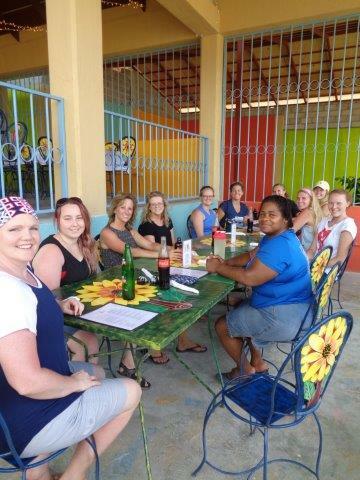 For some of our team, the day started early with an opportunity to serve at Haitian Initiative. 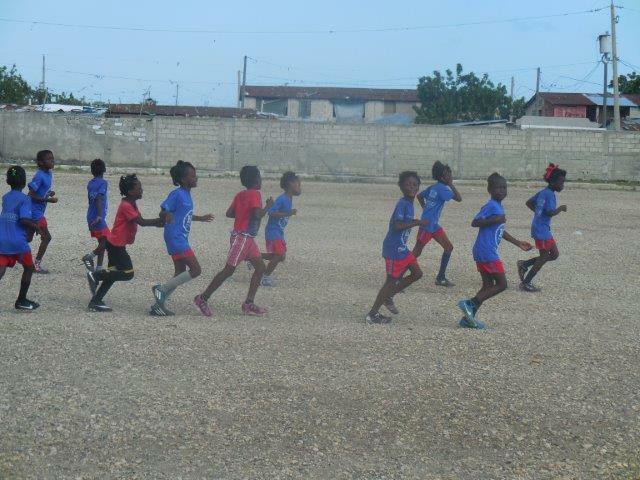 Haitian Initiative is an after school soccer program in Cité Soleil. 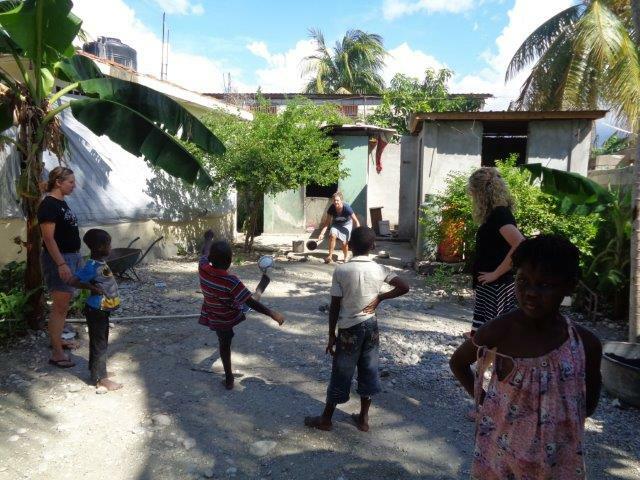 This is a place where the children in the community of all ages, boys and girls, are given opportunity to play soccer, and so much more. They have the opportunity to go to school, be coached and mentored by peers and adults who care about them and their development. They are fed a meal, and get to play the game they love most. The athletic trainers on our team were able to run a sports injury clinic this morning. We saw about 20 kids and coaches today with a variety of ailments, from blisters and lacerations to knee and elbow sprains, and fractures. We know the need is greater than what we were able to provide today, but we just pray we were able to be a blessing to those we did treat. 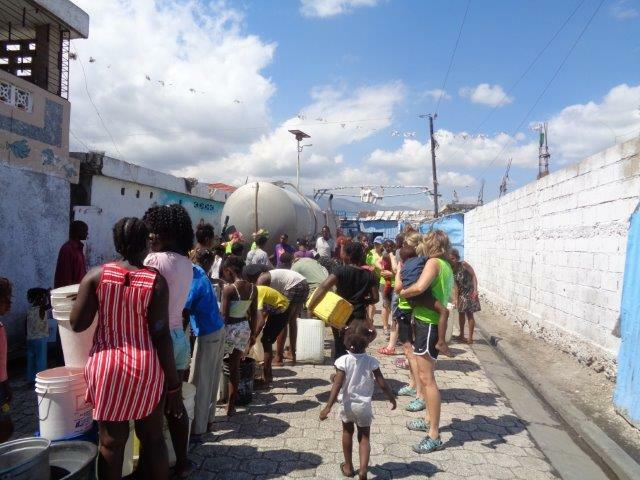 After that, our team served in Cité Soleil delivering water at two different stops. The first stop was one of the same stops from Wednesday. The second stop seemed to have so many more young children than our other stops. The need also seemed much greater today. At both stops, there was still a line waiting for water after the truck was empty. For many, today was difficult. The lines were longer, the buckets seemed heavier and the desire from the children to be held and loved was so much greater. 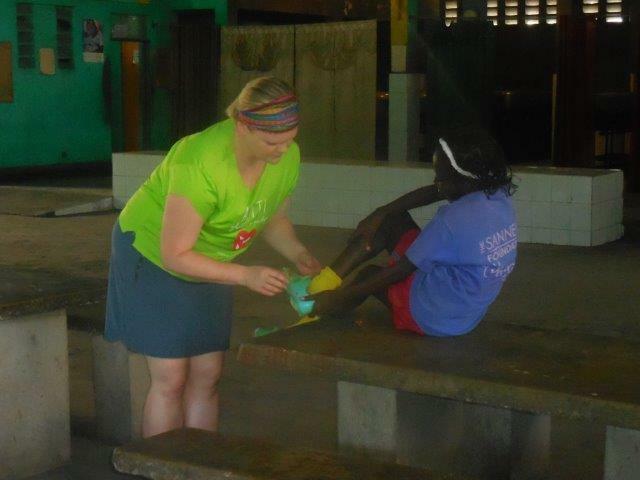 We struggled with trying to fulfill the needs of carrying buckets and loving on children. It was a good reminder that we, as human beings, cannot be and do it all. 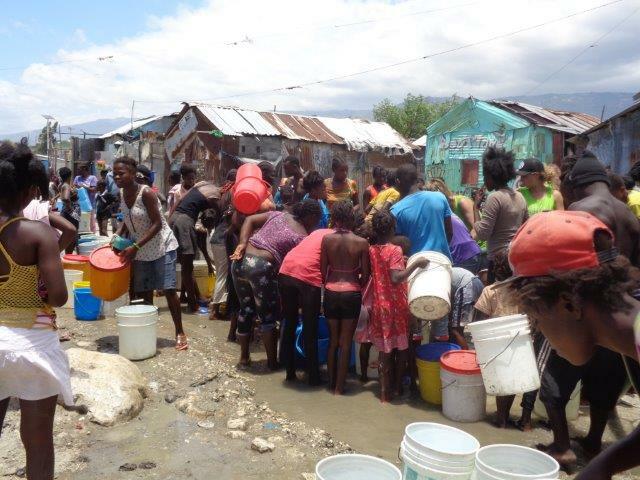 We need to rely on God for every need…and ironically that is exactly what the Haitians are doing – trusting and relying on God to provide for all their needs. And in a very small way, we had the privilege of being part of that plan today. Our next stop was back to the guesthouse for a quick and much needed shower before heading to a nearby orphanage. 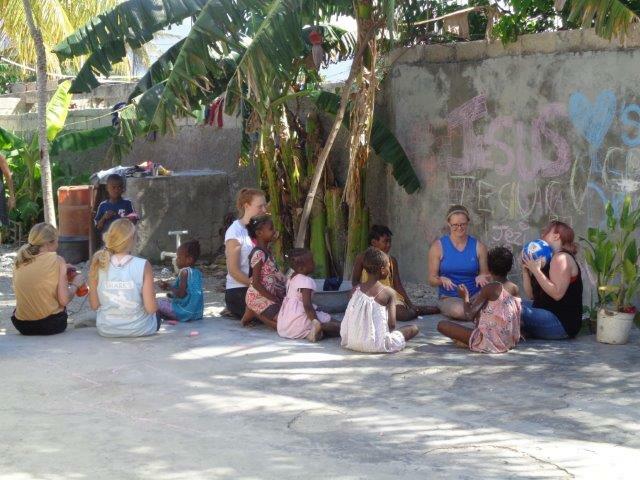 The orphanage that we visited has around 35 kiddos ranging in age from 6 months to 18 years old. 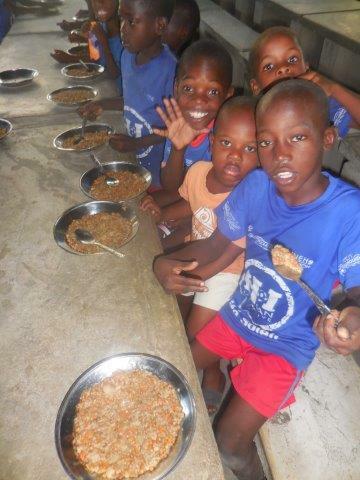 The children were well cared for and genuinely excited for our visit. They welcomed us with open arms. 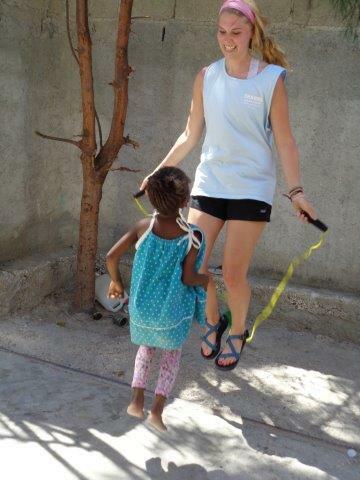 We did a variety of activities, including sidewalk chalk, jump ropes and of course soccer! Our time there seemed to fly by and before we knew it, we were saying good-bye to some amazing kids. Lastly we had the treat of going to Fleri Restaurant for dinner. Our server was one of the kids transitioning out of Grace Village. The transition program is for the kids that have reached adulthood and are in process of finding a trade to allow them to become independent. We ordered appetizers, pizzas and of course some amazing desert! 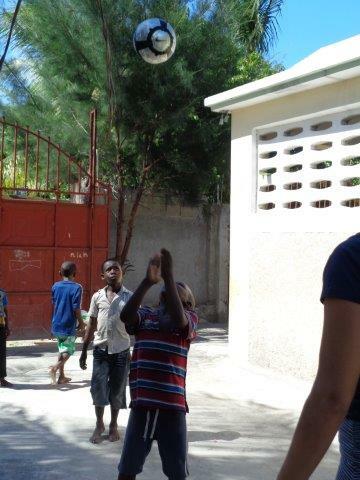 Fleri is such a great example of the hope and beauty that comes from empowering the Haitians to flourish.